NBA Development League team owned and operated by the San Antonio Spurs. Affordable, fun, family entertainment at the Cedar Park Center. 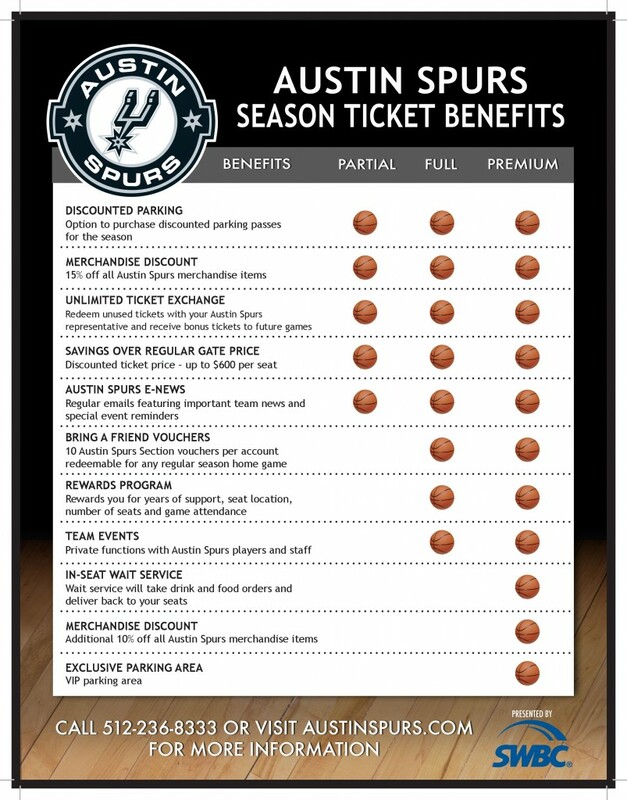 To be quite honest, I didn’t plan on attending a basketball game with my family, but we recently closed on a house in Austin and were sent a bucket of deal cards for the area at our new house and they included things like getting free quotes and discounts on home security to *gasp* four free tickets to an Austin Spurs game. I immediately separated the cards into piles of events for our family to do and quickly discarded a majority of the deals for things like home owner’s insurance (which we already have and are happy with…) While our family enjoys watching the occasional football game (and every Buckeyes game that we can!) we don’t watch basketball. I actually didn’t even realize Austin had a NBA development league called the Austin Spurs until now! However, I couldn’t pass up the opportunity for our family to attend and I know a little bit more about basketball than I realized and that’s all thanks to my dad. I couldn’t tell you many conversations I had growing up with my dad. He seemed to always be at work, doing some physical activity away from us, or looking for deals – the original ‘picker’ from Appalachia before it became a TV series on the History channel. My dad has a drive to do things that seems to come from a place of needing success and wanting to escape poverty. He started working as a teenager to help out his family when his father, a Veteran and B&O Railroad employee, had to take an unpaid leave of absence for health issues. The family had no income during this time and my father, a Catholic school boy and SE Ohioan from a mainly Scots-Irish family, had a desire to be the best. He wasn’t a healthy child, he had terrible allergies, the kind where he would have to go to the doctor to get shots so he could breathe, and he was a tiny and scrawny kid not reaching his 6 foot potential until he almost graduated high school. Too small for football, his sport of choice was always basketball and he played on his Catholic school’s team until he graduated even while jugging a job at a chicken joint between classes and practices. He wasn’t the biggest or best player, but he always showed up. Even during college (which he received a Pell grant from being from a low-income family), he would play and even when his back was so bad due to injuries he sustained in a car accident as a kid, his doctor at one point insisted he have his spine fused in his neck area, my father refused so he could continue playing basketball. I remember my dad being in almost constant pain and doing therapy when I was a kid, but he would somehow always show up at the YMCA most weekday mornings before work to play with a team. My father started his post-college career as an Ohio State Auditor and became the Director of the Department of Human Services (now Job and Family Services) in several Appalachian counties in Ohio until his retirement. I later learned my dad took the Civil Service test only because of his impatience and unwillingness to wait while my mom took hers (she went on to become a Medicare caseworker) that he went in and took the test, too! One year our family visited the Governor’s mansion in Ohio and he received a major award for his service before his retirement several years ago and I do know he was instrumental in bringing a community college, dental service for low income families, and the Welfare to Work program in SE Ohio. I learned this through stories about him in our local paper, but it was his love of basketball that I knew the most because I saw it. If I inherited anything from my dad other than his DNA, it was a drive to succeed against all odds and a level of commitment to service because it was ‘just the thing you do’. My dad’s sole career advice to me was to be a ‘garbage man’ because ‘you got great benefits and a good pension’. It’s not what I did, but that advice basically sums up who he was – who he IS. Practical, driven, focused. It’s something that the game of basketball gave him and, while none of his kids ended up being sporty, I can certainly now appreciate his life accomplishments on and off the court. In a round about way, I guess I’m saying I wanted to see the Austin Spurs game to get an appreciation for the game and to have my girls and husband have a great time as a family in a sport we don’t normally watch or discuss. My girls adore their grandpa, whom they only see once a year, and whether I realize it or not, I always try to make connections with him that I felt like I missed as a child. I can’t turn back time, but I am very fortunate that my father, in his mid-60’s now, is still very healthy, active, and loves being a granddad. He may have been more excited than I was when I told him we were going to see the Austin Spurs and this post is dedicated to him. 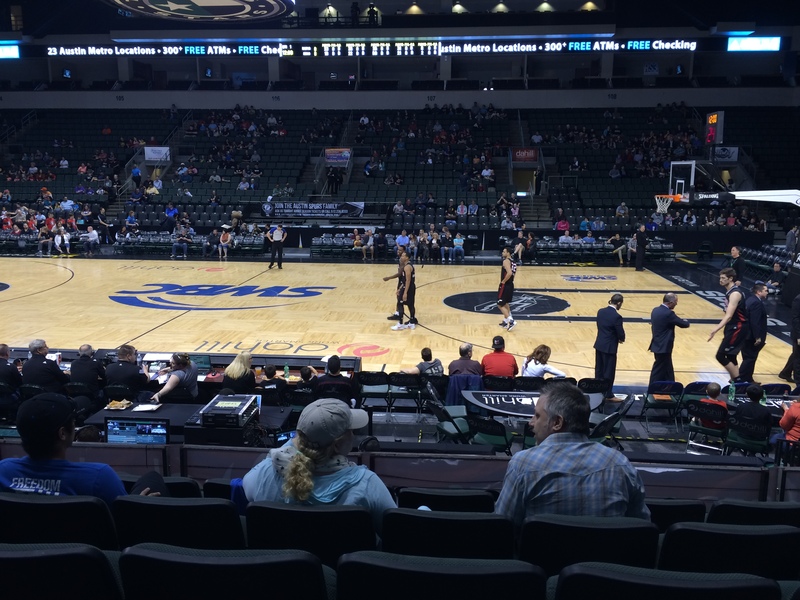 Now on to the Austin Spurs game we attended an Austin Spurs vs. the Idaho Stampede’s at the Cedar Park Center today and any local looking for any serious basketball games to attend in our home city should know they do not have far to go! 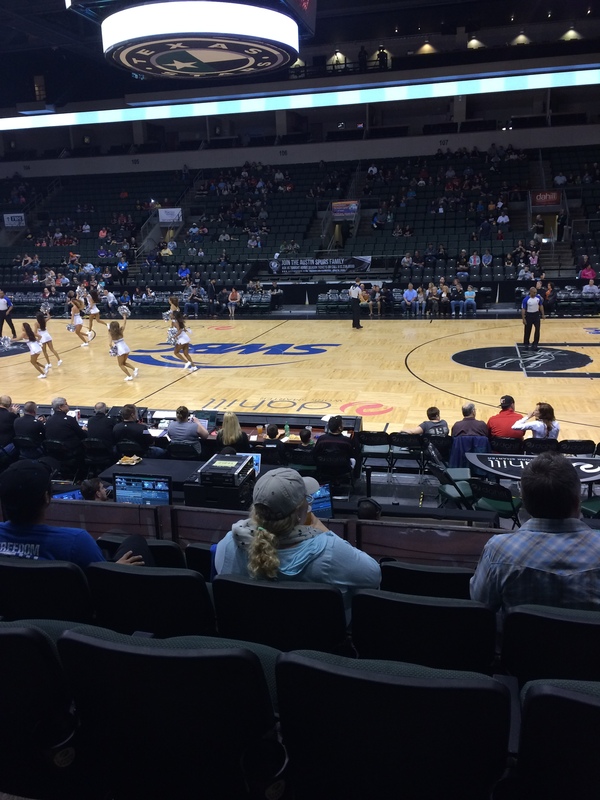 Back to the Austin Spurs and the Cedar Park Center! 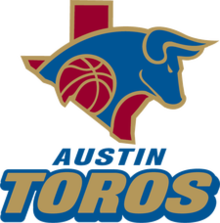 One reason I may have not heard of the Austin Spurs was because the team actually recently changed their name in 2014 from the Austin Toros after being purchased by the NBA San Antonio Spurs franchise. The team was originally called the Columbus Riverdragons that hailed from Georgia until they were sold to Southwest Basketball, LLC, and were relocated to Austin back in 2001. Since becoming the Austin Spurs, the team have been very successful and have made it to the postseason 7 out of their 12 seasons in the NBA Development League. Not bad! Besides what anyone can read from their website and Wikipedia page, we were going to the game as having a clean slate to the team and the game. It was actually exciting to be able to experience a basketball game with little knowledge of what to expect and we were ready to head to the Cedar Park Center where the game began promptly at 3 pm. I am so glad I read the tip online to have ten dollars on hand for parking when you get to the center. For whatever reason, parking was only eight dollars for our game, so that was nice. You have to go through scanners before you get into the stadium so be prepared for that, but the process was relatively simple and quick. I was warned ahead of time about the high cost of refreshments, and BOY, they were not kidding. $10 for a slice of pizza and it’s almost as much for a bottle of water as it is for a beer (which we didn’t get either), but we did get a pretzel and lemonade for the girls and they were happy. We had decent seats and it was “First Responders” night at the game, so lots of fireman and police officers. 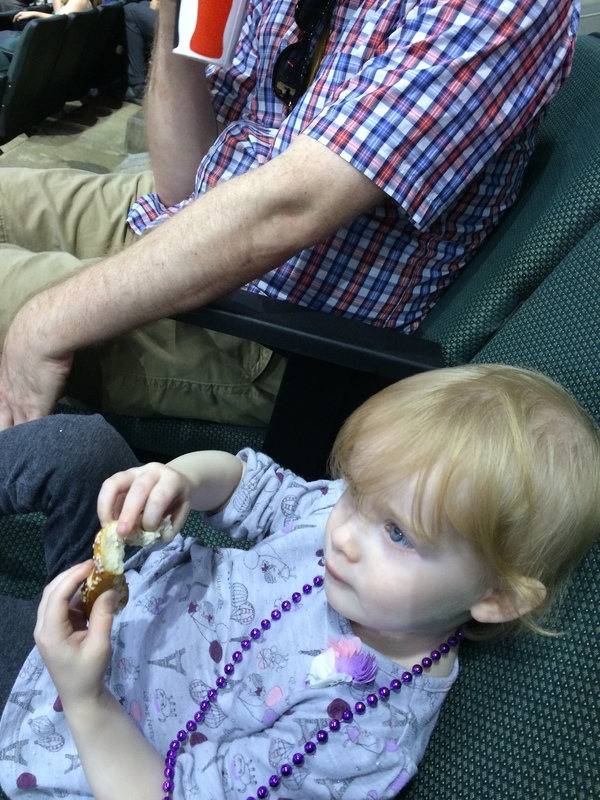 Brooke was in love with watching the cheerleaders, cheering for the Austin Spurs and didn’t miss a single DE-FENSE chant! She was so lively, in fact, that for the first time in my life, I was on the big screen cam when Brooke and Brie decided to do the ‘Chicken Dance’ and it was hilarious. Unfortunately, I didn’t get a picture of that, but that is something Brooke and I will never forget. I was surprised at how much Brie was really into watching the game so it made the game even more fun and enjoyable for me. We were all invested in the game and were cheering for the Spurs all the way. 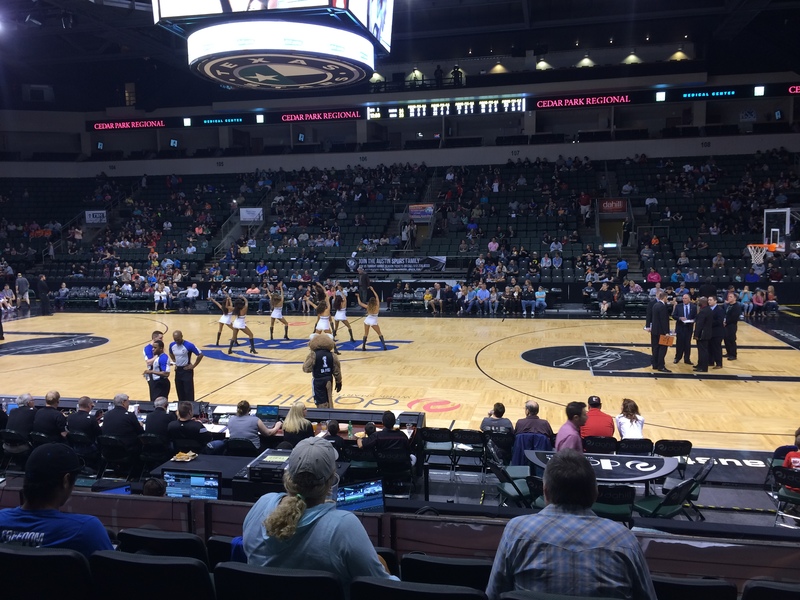 The game, for being a minor league event, was surprisingly high quality and the Cedar Park Center was impressive with their large screen, fun half time events and lots and lots of chances to dance, win better seats, and interactive with audience members to win prizes. It was fun! We had $20 dollar seats and I honestly don’t think there is a bad seat in the house. The best part of the game? 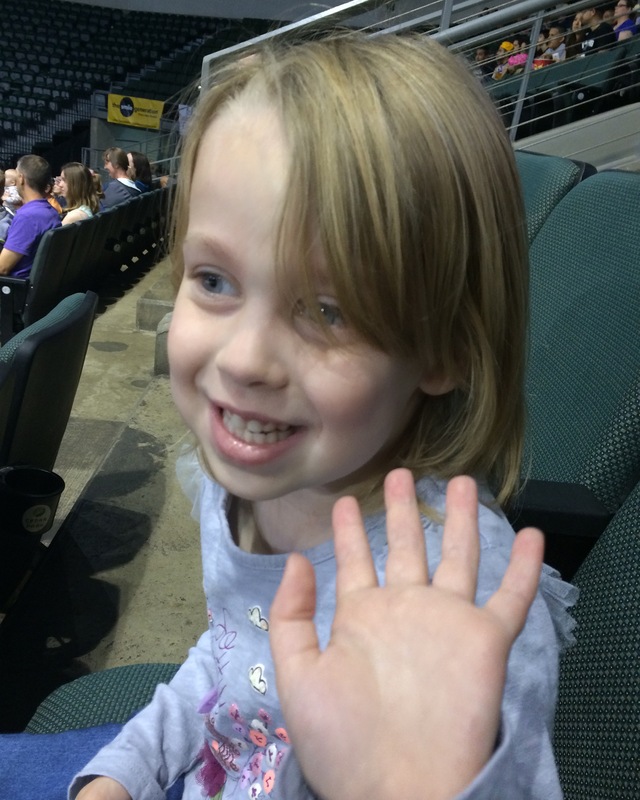 The Austin Spurs won over the Idaho Stampedes and, boy, was Brooke EXCITED! I definitely see us attending in the future and can’t wait to go again. Maybe I’ll take my dad on his next visit to Austin. I know he and the girls would LOVE it. Please Note: Parking is $10 and is cash only. Valet parking is available for $15, cash only. Doors will open one (1) hour prior to game time.